I’ve posted examples related to this topic before. Necessity is the mother of invention. In coaching students to become good GMs, I crafted this list to help give specific “to dos” that can help GMs improve their skills. This entry was posted in Classic RPGs, Dungeons and Dragons, empathy, Empathy and Games, Game Psychology, General Gaming Thoughts, House Rules, Savage Worlds, teaching, Teaching Games and tagged empathy in games, Game Psychology, Good Game Master, Role-playing games, RPGs, teaching games on February 7, 2015 by klecser. My friend DJ is putting together an interesting Savage Worlds game for us to play tonight! This entry was posted in RPGs, Savage Worlds and tagged RPGs, Savage Worlds, War of the Dead on January 4, 2015 by klecser. 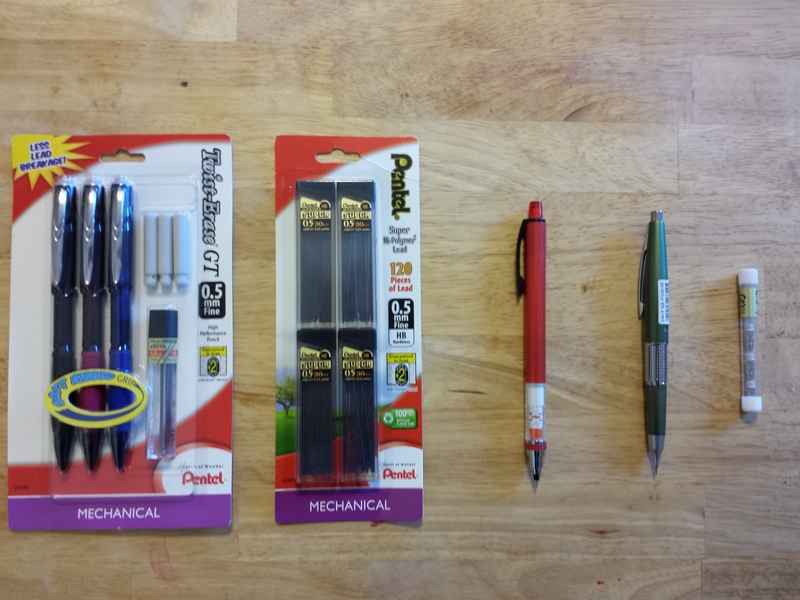 I received a bunch of pencils for the holidays. Some were desired duplicates. Some are brand-spanking new never-owned-befores. Here’s a pic of what I received that are duplicates of what I have. All are 0.5 mm. Three Pentel Twist Erase GTs with accoutrement. A lifetime’s worth of lead. Thank you sibling-in-laws. A Uni Kuru Toga in blaze red. Thank you me. A green Pentel Sharp Kerry. Replacement Pentel Z2-1 erasers. Thank you Mother! The Uni Kuru Toga is the best story. I bought that for myself from jetpens. Why? I brought my mechanical pencil collection with me on our trip to visit my parents. My cousin Arianna took particular interest in the collection. It turns out she loves mechanical pencils too. She lives in a rural area, so I’m not surprised that she hasn’t been introduced to premium pencils. She took quite the fancy of my old Uni Kuru Toga and its unique lead rotation mechanism on Christmas Eve at my parent’s place. So, I did what any good cousin would do: I wrapped it up and gave it to her Christmas Day as a gift. She really appreciated it. I took the opportunity to replace it with a unique variant of it in my primary school color. Everybody wins. Over the next few weeks I’ll be reviewing other pencils that I received as gifts over the holidays. The Top Ten list is likely to get a shakeup, including potentially bringing back pencils that I had booted off the list. Why? I’ve had quite the opportunity to write a lot over this holiday break and my opinions on some of the pencils that I had just based off of features has changed now that I’ve had more of a chance to use them. More to come! Also, plenty of gaming reports will pop up as I plan to play X-wing Miniatures and Savage Worlds RPG over the next week before heading back to my professional work. Stay tuned Tactical Thinkers! This entry was posted in Classic RPGs, Pencils, RPGs, X-wing Miniatures Game and tagged mechanical pencils, Pencils, RPGs, Savage Worlds, X-wing Miniatures Game on December 30, 2014 by klecser. On Tuesday we had a rousing game of Dungeons and Dragons! This entry was posted in Dungeons and Dragons, Game Club, RPGs and tagged Dungeons and Dragons, Game Club, mysterious benefactor, Role-playing games, RPGs on November 27, 2014 by klecser.